Twas The Night Before Christmas…. and if you still need Christmas flowers then you have come to the right place! 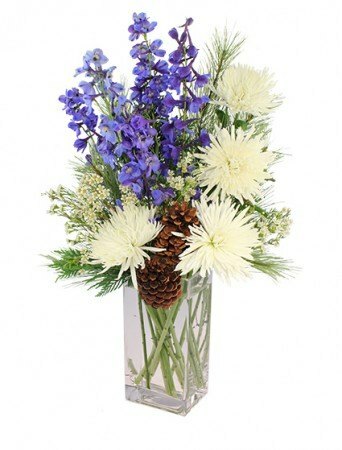 Wintry white spider mums and white waxflower surround brilliant blue delphinium and natural pinecones in a tall vase. Order this dazzling bouquet of winter flowers today! “A Visit from St. Nicholas”, more commonly known as “The Night Before Christmas” or “‘Twas the Night Before Christmas”, is a poem first published anonymously in 1823. The poem was originally attributed to Clement Clarke Moore, who claimed authorship in 1837. Some commentators saw however that the poem was written by Henry Livingston Jr. The poem is regularly called “the best-known verses ever written by an American”. This poem is also largely responsible for the conceptions of Santa Claus in popular culture. “A Visit from St. Nicholas” eventually was set to music and has been recorded by many artists. When you order custom flower designs, they are produced as closely as possible to the picture. Also, because each design is custom made no two arrangements are exactly alike. Therefore, color and/or variety substitutions may be necessary. Prices and availability of seasonal flowers may vary. Our professional staff of floral designers are always eager to discuss any special requests. Please do not hesitate to call us and we will be glad to assist you with something special. See our designs on Facebook! Remember, we offer free personalized cards, vases & ribbons upon request - and same day delivery is our specialty!